There will likely be some bitter cold to contend with this weekend, especially for those with no heat. Wind Chill values are in the 30s, with a raw breeze Saturday morning. Saturday night through Monday night temperatures fall below freezing in many suburbs, bringing a risk of hypothermia for anyone exposed to the cold for extended periods of time. - Heavy rain, which could cause localized flooding. - Coastal flooding with the potential for flooding exacerbated by damage from Sandy. Fortunately tides are expected to be lower than during Sandy. - Winds could surpass 40 mph, with the strongest winds along the coast. - A wintry weather mix may occur north and west of the coast. The storm is still several days away and its track may change. TODAY: Partly sunny, breezy and cool. 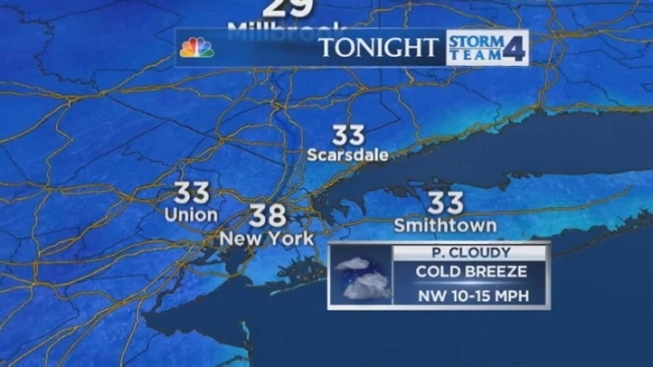 TONIGHT: Mostly clear, breezy and cold. MONDAY: Mostly sunny, breezy and chilly. THURSDAY: Showers taper off, windy.